In my recent post, I discussed the origins of evolutionary thought, reaching as far back as the philosophers Plato and Aristotle. I ended by talking briefly about Mendel’s work on heredity, which went largely unnoticed in the late 19th century. It was rediscovered by a group of biologists in the early 1900s who came to realize that Mendel’s research provided the mechanism for inheritance that was notably lacking in Darwin’s theory of evolution via natural selection. If they could verify Mendel’s observations, reconcile them with Darwin’s theory, and isolate the molecule(s) responsible for the patterns he described, they could potentially spark a revolution in the biological field. Piece of cake, right? And yet, by the late 1900s, these three goals would be fulfilled by the body of work known collectively as the Modern Synthesis of biology. One of the major divisions between Darwin and Mendel was the way they classified variation. Darwin saw evolution as a gradual process leading to variation that was similarly graded. He thought that variation is mostly continuous – that is, it exists along a spectrum. Human height, for example, is one such continuum. Mendel, on the other hand, predicted that most variation would be discrete. Pea plants have either purple or white flowers. The gene that codes for this trait has two possible alleles, or variant copies of that gene, symbolized by a capital A and a lowercase A. Those alleles can be combined in only three ways – AA or Aa producing purple flowers, aa producing white ones. There is no continuum – discrete variation can be placed in definitive, unequivocal categories. Mendel’s genetic patterns at first seemed unable to create continuous variation. However, in 1918, a statistician by the name of R. A. Fisher showed that continuous variation could arise from many genes of small effect acting on a single trait. For example, let’s return to human height, which is determined by many genes acting together. Say that there are four genes determining height, and each of these genes has two alleles (A and a, B and b, C and c, D and d). Those eight alleles can be combined in 81 distinct ways, leading to 81 possible heights. If we add another gene controlling height, we’ll have 243 unique combinations, and so on. Thus, Fisher showed that many genes acting together to influence a single trait could in fact produce a continuum much like the one we see in our height example. A major roadblock to the acceptance of evolution has always been its supposed dependence on impossibly long timescales. As a species, we aren’t very good at thinking about time beyond our own personal experience of it, which is by necessity a single lifespan of about eighty years. It’s often a stretch for us to feel connected to the events of history even two hundred or a thousand years past, let alone to conceptualize evolutionary events occurring millions of years ago. We just don’t have the context for it. However, another big name in the Modern Synthesis, J. B. S Haldane, was the first to show that evolution could occur on a timescale we could observe within a single researcher’s career. In the 1920s, Haldane showed that mathematical models combining natural selection with Mendelian genetics could account for the rapid and recorded natural evolution of peppered moths. Before the Industrial Revolution, these moths were mostly light in color, living primarily on light colored lichens and tree bark. Dark moths existed in nature, but only rarely – they were more likely to be seen and eaten by their natural predators, like birds. As the bark on the trees became darker with pollution, and being dark began conferring a survival advantage, the darker moths became more predominant – at a stunningly fast rate. Haldane explained this change mathematically using both genetics and selective forces, again showing that the marriage of these two ideas could provide a better explanation for evolution than either one could on its own. Despite these advances, the Modern Synthesis was still lacking the molecule of inheritance. Theory held that this molecule would have a mechanism for carrying information and a mechanism for copying that information nearly perfectly thousands of times. It would exist in most, if not all, cells. In 1952, Alfred Hershey and Martha Chase demonstrated that DNA played a role in heredity, at least in a virus. 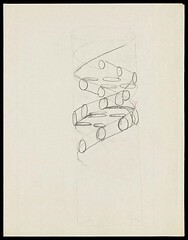 Based on an X-ray diffraction image taken by Rosalind Franklin in the same year, James Watson and Francis Crick proposed a model of DNA which immediately suggested a mechanism by which the information it carried could be copied. By unzipping the two strands of the double helix and using the base pairs of each strand as a template for a new strand, the molecule could replicate itself with minimal errors. These and other discoveries convinced biologists that DNA was the very molecule they’d been searching for. With DNA in place as the face of inheritance, the focus of evolutionary researchers shifted mainly to cracking its code – sequencing DNA in order to finally be able to read the cookbook of life. The gene is the thing, and for the last sixty years, that gene-centric paradigm has held. In the final segment of this post, we’ll take a look at what’s missing from the Modern Synthesis and what the field is turning to next.